How Do I Choose A Book To Read To My Child? As a Teacher, I am often asked “How do I choose a book to read to my child?”. As parents we worry that there are certain books that we should be reading to our children. And whilst there are some books I would consider ‘unmissable’ (that’s another article! ), I kind of think as long as you are reading to your child, it really doesn’t matter what it is! I know, I know – it might be a book you’ve read a thousand times or one that you don’t like, but if they have picked it, at least you know they are interested! Children love to join in with reading. So if a phrase is repeated throughout the book, they pick up on it, remember it and perhaps join in when you read it. Most children feel very proud if they can ‘read’ a bit of the book. Children enjoy a simple rhyming story because it is predictable. As a bonus, it also helps them develop their sound awareness skills – an essential literacy skill. You can have a lot of fun with a book that uses alliteration – for example ‘seven sizzling sausage’. Give your child the opportunity to hear the sound several times and if you point to the words, they may begin to recognise the letter symbol that makes that sound. You can often get the most reluctant of listeners to sit down with you to read if it is a subject that they like. They may also be inspired to do other learning projects based on the topic like craft or writing activities. 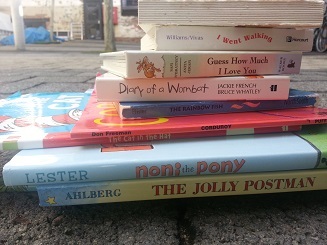 Because you are doing the reading, you can choose a book that might be full of gorgeously descriptive words or perhaps a book that has subject specific words like Triceratops, Diplodocus or the ol’ Baotianmansaurus! When exposed to new words, children have an opportunity to learn them. Reading the text in a book is one thing, but discussing and exploring the illustrations/diagrams/ photos etc in a book is another. You and your child could have a great chat about the pictures which really helps their oral language skills. If the book has no text, you can encourage your child to make up the story based on the pictures. I’ve read chapter books to young children with no illustrations and they have hounded me to read the next chapter! By not showing any illustrations you are allowing your child to ‘create the movie’ in their own mind. They get caught up in the adventure and the excitement – such a great place for children. It also helps children focus just on the language. 9. If You Pick Up A Children’s Book And Enjoy It, Read It Out Loud! Your choices will probably be good. If I laugh at a story, I like to share it with a class and hope they laugh too. I will also share books that make me feel other emotions like sadness, anger or frustration . To just experience a story is so lovely. There doesn’t always have to be any other reason to read a book another than for enjoyment. So next time you are choosing a book to read out loud to your child, I hope the suggestions above can be of help! How do you select a book for your child? I’d love to read your comments below!